Are you a tuner? Do you like high speed? Are you impressed by professional skills and dynamic sporting driving style? Then we have the right tool for you! Our SPORT shocks Kit provides the ultimate shock absorber technology by KONI. This means that you can have even better roadholding, less chassis movement and performance support without limits. Show what you've got and experience the unique driving dynamics with optimum safety! 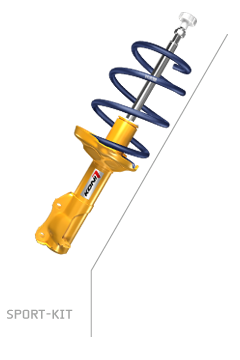 Optimum combination of sport shocks and springs, with aggressive roadholding and improved safety. The SPORT definition of driving pleasure is available now from your dealer or tuning specialist. Offering your car exceptional roadholding, direct steering and reduced tail wag providing increased driving comfort. Complete shocks kit - consisting of four KONI high-performance car shock absorbers and precisely-fitting KONI lowering springs.